With its statement looks and the imposing diameter of its black PVD steel case, the Renaissance Black Tornado - even this finely skeletonised - doesn't go unnoticed. The architecture is modern, with fine circular chasing on the black NAC-coated movement. The dial has been removed to reveal the mainspring's fascinating coils, and the rotation of the different wheels as they mesh. 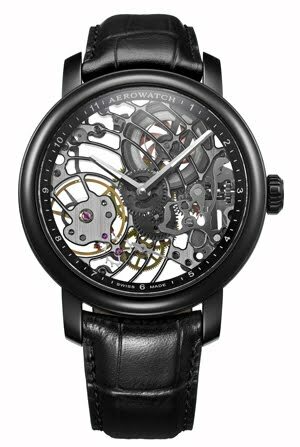 Technical, elegant and contemporary, this new creation from Aerowatch appeals as much to aficionados of authentic mechanisms as to fans of finely-crafted Swiss watches at an attractive price.